Simply touch the test leads to the battery terminals to easily capture battery condition data with the Hioki BT3554 Battery Tester. Automatically save measurements results using the auto-hold or auto-memory function in just 2 seconds, a 60% reduction from the legacy product. 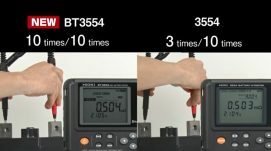 Learn more about the BT3554 Battery Tester at https://www.hioki.com/en/products/det…. Next PostNext Bluetooth Wireless Technology , Cut Worktime in Half !